Within the past few weeks, both the soccer teams on which I play won their respective league championships. These achievements, while trivial in the grand scheme of life, nevertheless fill me with pride and some satisfaction. It wasn’t so much that the teams won that has me feeling so positive, it is the manner of how: each squad overcame adversity and challenges to emerge victorious, although the specific challenges facing each team were different. If sports are a metaphor for life, then there are some good lessons here. 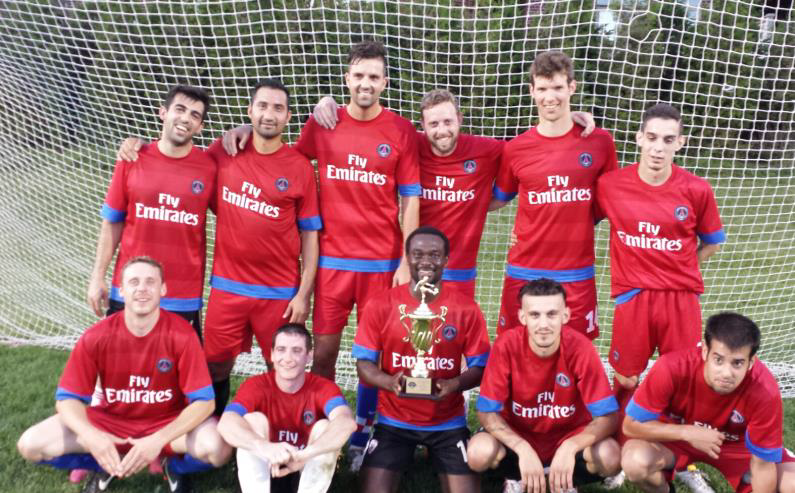 Exports play in the premier division of Grand River Soccer, and came into the 2014 season as favourites to defend the title won last year. Things didn’t start off all that well, though: four games into the season we found ourselves with a record of two wins, a loss, and a draw. For most teams, that record would be OK, but we expect to win every game. And I don’t mean that arrogantly, I just mean that we are a talented group, with a few years of chemistry, and we go out each week to win. The biggest problem at that early juncture wasn’t the record, but the play. Our devastating attack was sputtering, we were making defensive miscues, and our midfield wasn’t the dominant force it had been in years past. Our roster had changed slightly, but not to the degree that the on-field performance should change all that much. In fact, although we were at 2-1-1, we probably deserved to be worse off, having snatched some points in the closing minutes of two of those games. Grand River Soccer has some very skilled teams – last season came down to the final day of the season and the top teams had returned largely intact – so we knew we couldn’t afford to be dropping points. We’d actually played two of the top teams in that opening four game stretch, and at that point we were tied for top in the league, but there was growing concern about the poor performances relative to our own expectations. In week five, we cruised to a comfortable 3-1 win. In week six, we crushed a primary rival 5-2. Things were turning around. Plus, league parity was at an all-time high, and teams were stealing points off each other in some surprising results. The consequence was that we were starting to open up a bit of a lead in the league title race. But July brings vacations, and by this point in the season injuries have started to take their toll. We were without the league’s best centerback for a crucial four game stretch due to vacation, and between other injuries and absences we played with a patchwork line-up for the rest of the season. 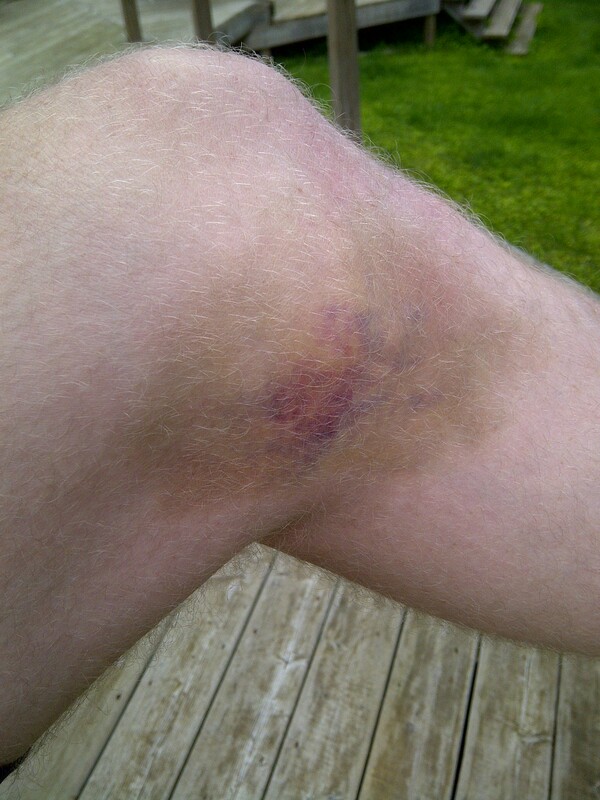 This photo was taken nine days after the knee-on-knee I took in the first game of a back-to-back night. A 6-3 win over a main rival in which many of our guys were playing the second of back-to-back games that night, and in which we scored four goals in the last ten minutes. Two of those were by our manager, Ruben, who only came on to play for the last twenty minutes and scored a highlight-reel brace in the span of five minutes. I played 180 minutes that night with the knee injury you see in the picture (actually, both knees were injured…). On corner kicks I was leaning against the post for some respite. A 3-1 win to clinch the title, that saw us gut out a win with a hodge-podge line-up (I played in center midfield for the only time all season) over a very talented opponent. I subbed off for the last ten minutes, as I was absolutely exhausted (and still very injured), but I felt satisfied that I’d done my part to earn the championship. We split our last two games as some of us injured folk sat out, but it didn’t really matter – we still won the league title by 6 points. Of all the titles I’ve been a part of, this one is up there in contention for most satisfying. Every single week we came out ready to play, no matter the circumstances, and more often than not we found a way to win. Of all the titles I’ve been a part of, this one is up there in contention for most satisfying. Every single week we came out ready to play, no matter the circumstances, and more often than not we found a way to win. Fusion plays in the premier division of the Tri-City Men’s Soccer League (TMSL). We won the title two years ago, and finished third last season. The season for Fusion was as interesting as that of Exports, and had the same ultimate result, but was about as different as is possible. Fusion’s season was characterized by inconsistency (alternating dominating play with listless ineffectiveness), dysfunction, and just enough victories to get the job done. The TMSL had extreme parity this year, with the eight teams finishing with these point totals: 26, 23, 23, 22, 18, 17, 16, and 12 (the maximum available points for the season is 42). On any given week, any team could beat any team. We finished with eight wins, four losses, and two draws – hardly a dominating season. Halfway through the campaign we sat at four wins, two losses, and a draw, and the team was coming off a poor stretch of play that was marred by a disgraceful moment of team dysfunction that almost saw us kick a player off the team. At that point, some of us got together over drinks to chat about the season and basically try to get things back on track. What made things a bit funny was that we were sitting alone in first at the time, but we all felt like we were having a brutal season. At that point, some of us got together over drinks to chat about the season and basically try to get things back on track. What made things a bit funny was that we were sitting alone in first at the time, but we all felt like we were having a brutal season. Basically, we either won or we lost; we either played brilliantly or brutally. There was very little middle ground for the team this year, and it showed in the results. Nevertheless, on the strength of our many victories, we were tied on points and held the tiebreaker against our main rivals as we headed into the final week of the season. That final game, though, was played under unusual circumstances. Should we win, then we earn promotion to the Kitchener and District Soccer League (KDSL), one of the better leagues in the country. While we are pretty much, to a man, excited about that prospect, there are some significant logistical issues that must be overcome. Without getting into the details, suffice it to say that getting promoted would significantly complicate matters for the Fusion soccer club. Consequently, before the game there was actually talk of “Do we even want to win this game?” That lasted all of about ten seconds, before we all agreed “Screw it, let’s go out and play and deal with the consequences.” In an absolutely epic match (which included a professional-calibre volleyed goal from our right-back and our keeper making a penalty save in injury time), we came out 3-2 victors and so wrapped up the title. I played about twenty minutes of the first half, with that knee injury, before coming off and planning on sitting out the remainder. Unfortunately, our left winger got injured with about twenty minutes left in the match and came off, thrusting me back onto the pitch. Making matters a tad difficult was the extreme speed of the players our opponents had on the right. I essentially said to myself, “Twenty minutes to clinch the title!” and I applied all the Mind Gym goodness I’d picked up (thinking positively, focusing on what to do rather than what not to do, etc.). I felt privileged to be on the pitch as the referee blew the whistle to end the match that made us champions. Six of us on the team were on the Fusion team that first earned our way into the premier division five (or six?) years ago. It’s been quite a journey. I haven’t played since that match, as I’m giving my knee some time to heal. It’s been almost four weeks and the bruising is still visible and there’s still internal swelling. Damn! The price of victory. Now we get to deal with the consequences! Personally, I’m excited by the challenge of upping my game to play against even tougher competition, and I’m very seriously considering a dedicated training regimen during the winter to get in the best shape of my life in preparation for the 2015 outdoor season. I’m gonna give it everything I’ve got! As last year, I’m not pictured. Since we won the league with two games to spare, and I was injured, I didn’t go to the next game…which was when the trophy was provided. Damnit! I swear I’m on the team.